The quick and robust steam sterilizers of the Euroklav series represent an affordable alternative to our Vacuklav series. They are ideal for practice and clinics which use instruments that do not require sterilization in a Class B steam sterilizer. Class S steam sterilizer designed and constructed to familiar MELAG quality standards. The device concept of Euroklav 29 VS+ with its pre and post-vacuum produces quick operating times, simple operation and versatile documentation. More space for your instruments. Class S autoclave with a deep sterilization chamber, high-performance vacuum pump and effective vacuum drying. Euroklav 29 VS+ brings perfect sterilization results, even with single wrapped instruments. Euroklav steam sterilizers are available in two versions to fit individual practice needs: The large volume of the 45-cm deep chamber (22 litres) Euroklav 23 VS+ means that it is especially-suited to the sterilization of both long instruments and larger loads versus the 18 litre Euroklav 29 VS+ (chamber depth 35 cm). As a stand-alone solution, Euroklav steam sterilizers provide maximum flexibility. Their integrated water storage container and effective air-cooling system mean that they can be operated without a water connection. The additional use of a MELAdem series water treatment unit makes working practices even easier. A connection set permits connection of the stand-alone steam sterilizer to a water inflow and outflow in the decontamination room, thereby enabling full-automatic supply with demineralized water. Gynaecological practices use particular instruments which require sterilization in a Class B steam sterilizer. The Class S steam sterilizers of the Euroklav series represent an affordable alternative with which to perform reliable, legally-compliant sterilization of medical devices without complex hollow bodies. The compact Euroklav steam sterilizers provides four Class S programs with a simple fractionated pre-vacuum for the sterilization of instruments such as specula and hinged instruments. Fitted with a high-performance vacuum pump, a simple pre-vacuum is generated before sterilization, to ensure secure air-removal from the packaging and the hollow bodies of the instruments. This ensures excellent sterilization of the hollow bodies of hinged gynaecological instruments such as scissors, dressing forceps and alligator IUD forceps. The effective vacuum drying of the Euroklav series Class S sterilizers ensures excellent drying results. You can wrap instruments before sterilization using either film and a sealing device or a sterilization container. The simple pre-vacuum procedure of the Euroklav series even guarantees the successful sterilization of multiple wrappings. The ideal workflow for a GYN practice is ensured via the MELAG system solution integrating a Euroklav and a MELAtherm 10 washer-disinfector. The cutting-edge electronics of our Euroklav series steam sterilizers can generate a wide range of documentation. 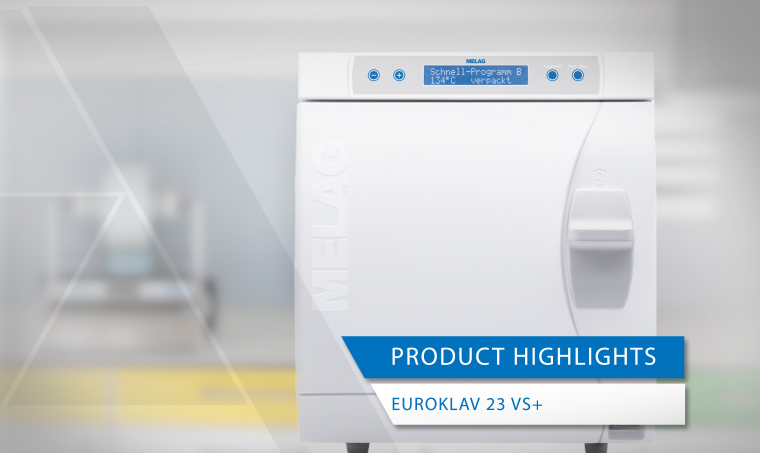 The Class S sterilizers Euroklav 23 VS+ and Euroklav 29 VS+ are fitted with a serial interface. You can read out the logs directly from the steam sterilizer using a documentation medium. Choose from between the MELAflash CF card printer, MELAnet-Box or MELAprint 44 log printer for documentation. Legally-compliant documentation of steam sterilization with the Euroklav series is easy and secure using the MELAflash CF card printer. Sterilization logs can be saved on a CF card quickly and easily without the need to connect your Euroklav to an external printer or practice network. We recommend regular data backup of the decontamination reports to your practice PC. MELAnet Box performs fully-automatic data backup. Connected to the serial interface of the Class S steam sterilizer, MELAnet Box saves the logs in the internal practice network or on the practice PC via a network cable. The additional use of the documentation and approval software MELAtrace integrates and digitizes batch approval of the entire instrument decontamination process. The compact MELAprint 44 printer enables you to print and store the logs in traditional paper form. The long retention periods to which the sterilized equipment documentation is subject means that we recommend that you save them on digital data carriers. Find out more about the documentation solutions MELAflash, MELAnet-Box and MELAprint 44.